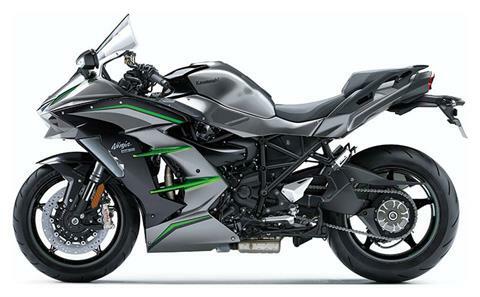 The new Ninja H2™ SX SE+, developed from the same bloodline as the Ninja H2™R hypersport bike, is the ultimate production supercharged streetbike that combines the most desirable hypersport, supersport and sport touring qualities. A balanced supercharged engine offers a versatile riding experience that delivers both exhilarating acceleration and superb fuel economy. For 2019, key updates include Kawasaki Electronic Control Suspension (KECS), Integrated Riding Modes, smartphone connectivity, Brembo Stylema® monobloc calipers, and highly durable self-repairing paint. Aggressive body design, specially machined wheels and all-LED lighting are among the styling highlights that make the Ninja H2 SX SE+ stand apart as a hypersport, supersport and sport touring icon. This is where luxury and performance reach stunning new heights. SMARTPHONE CONNECTIVITY (SEE MORE WITH YOUR PHONE): Bluetooth® technology enables smartphone connectivity, allowing riders to connect to their motorcycle wirelessly. Using the RIDEOLOGY THE APP smartphone application, you can do three key functions: View vehicle information and check the latest status of your vehicle. Keep a detailed riding log that can be played back for review. You can also view riding route, distance and time traveled. Easily change vehicle settings before riding such as Ride Mode and Electronic Suspension. BOSCH® IMU (INERTIAL MEASUREMENT UNIT): Compact IMU enables inertia along 6 degrees of freedom to be monitored. Acceleration along longitudinal, transverse and vertical axes, plus roll rate and pitch are measured. The yaw rate is calculated by the ECU using Kawasaki’s proprietary dynamic modeling software. This next-level system enables predictive and adaptive electronics for precise chassis orientation awareness to support the rider’s intentions with natural feel. KAWASAKI CORNERING MANAGEMENT FUNCTION (KCMF): ​Using the latest evolution of advanced modeling software and feedback, Kawasaki Cornering Management Function (KCMF) monitors engine and chassis parameters throughout the corner. From entry, through the apex, to corner exit, to assist riders in tracing their intended line through the corner. KAWASAKI TRACTION CONTROL (KTRC): ​​Whereas many competitive traction control systems react to wheel-slip, this IMU-enhanced feedback version of KTRC predicts conditions and acts before slippage exceeds the range for optimal traction. When turned on, riders can choose from 3 modes, allowing riders to choose the degree in which each mode intervenes during riding. Riders may also elect to turn the system off. Modes 1 and 2 are optimized for maximum forward acceleration while mode 3 allows for assistance during wet pavement conditions. POWER MODES: The Ninja H2™ SX SE+ comes with three power modes: Full, Middle and Low, allowing riders to select power delivery to suit their preference and riding conditions. 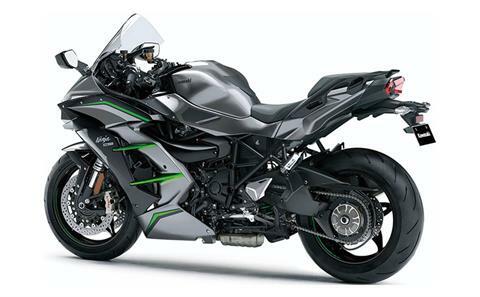 KAWASAKI ENGINE BRAKE CONTROL​: This system allows riders to set engine braking according to preference. When the system is activated, the engine braking effect is reduced, providing less interference when sport riding. 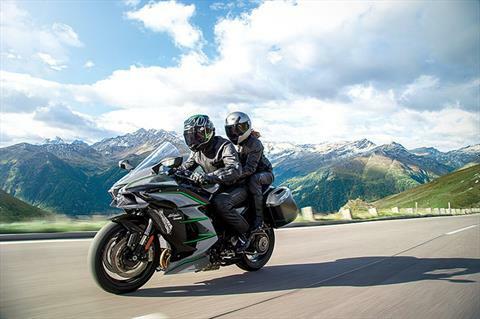 INTEGRATED RIDING MODES: Integrated Riding Modes allow you to set traction control, power delivery and suspension character with the push of a button deliver confident riding in a variety of situations. 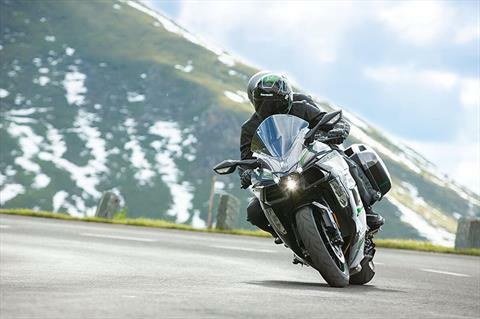 Linking Kawasaki TRaction Control (KTRC), Power Modes and Kawasaki Electronic Control Suspension (KECS), these all-inclusive modes give riders the ability to choose from three programmed settings and a customized rider (manual) setting. 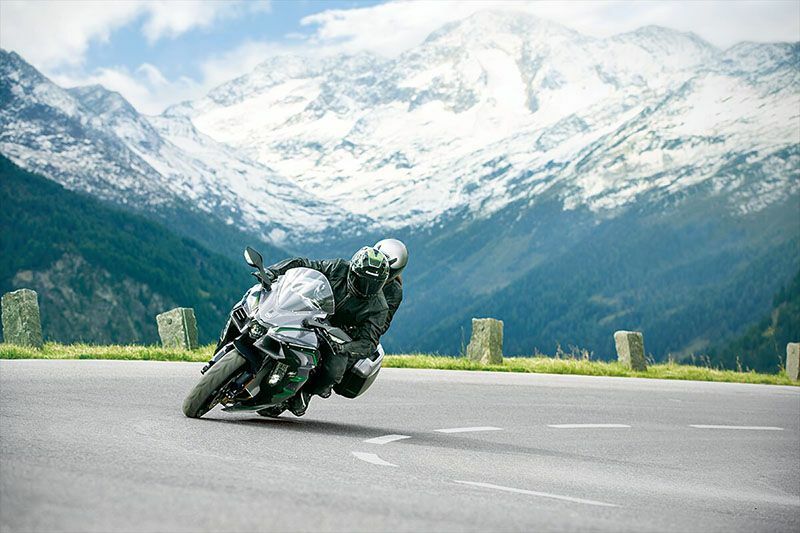 Sport Mode allows riders to enjoy sporty riding on winding roads. Road Mode offers comfortable riding over a wide range of situations from city riding to rural roads. Rain Mode offers rider reassurance when riding on a wet surface. Rider Mode (Manual) allows independent adjustments to suit rider preference. 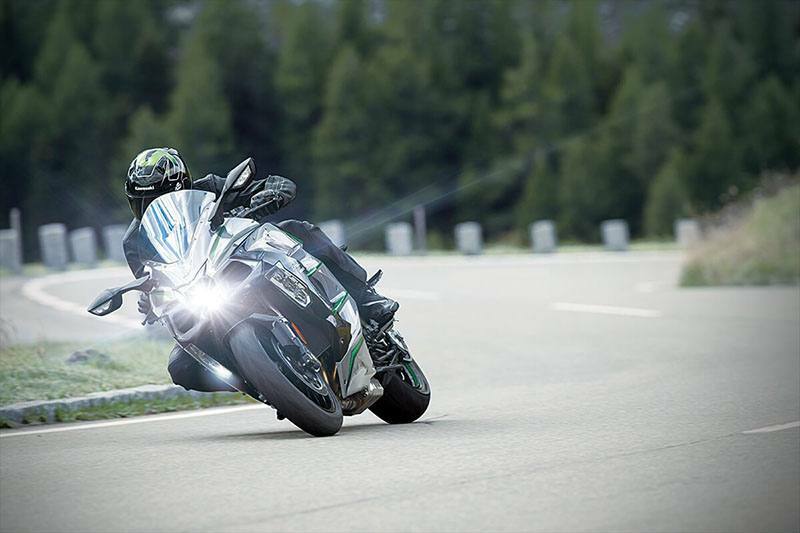 ALL-LED LIGHTING: The Ninja H2™ SX SE+ is equipped with LED lights from headlamp to taillight. DOG-RING TRANSMISSION: ​​Designed for high-performance racing engines, the premium dog-ring transmission allows for smooth, precise, quick shifting. Rather than shifting gears into place, the gears in this configuration stay in place while the lightweight dog rings move to engage the selected gear. A high-quality hydraulic clutch self-adjusts to ensure consistent performance and smooth actuation. BRAKES: Brembo Stylema® calipers are lighter and have less volume around the pistons and brake pads, enabling a more direct braking response. ​An increase of airflow around the brake pads and an opening that allows air to exit from the central bridge allow the calipers to cool rapidly. The dual radial mount, opposed 4-piston Bremo Stylema® front caliper grips a semi-floating 320mm discs that are equipped with KIBS ABS to complement the technical innovation and premium quality of the Ninja H2™ SX SE+. 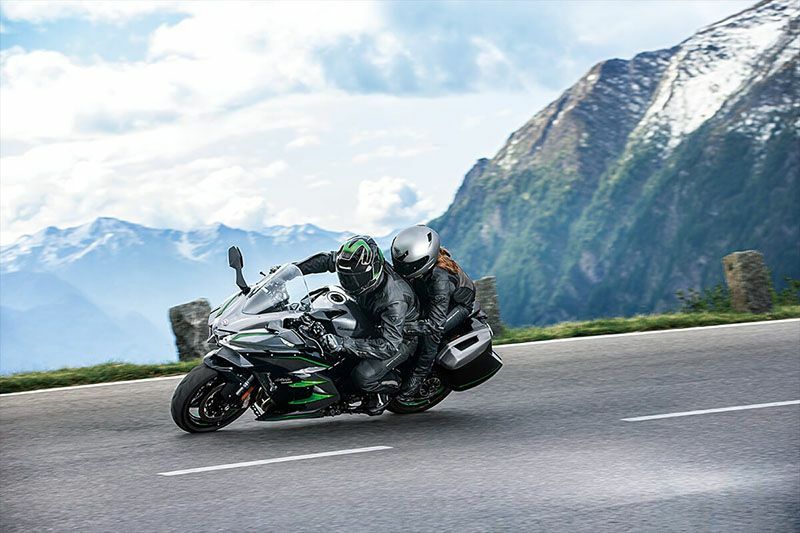 KAWASAKI INTELLIGENT ANTI-LOCK BRAKE SYSTEM (KIBS): ​IMU-enabled Kawasaki Intelligent anti-lock Brake System (KIBS) is a supersport-grade high-precision multi-sensing ABS brake assistance system. Uses high-precision control to modulate brake pressure during sport riding to help ensure ABS pulses feel smooth and lever feet are maintained when KIBS is active. WHEELS: The cast aluminum wheels were designed for optimized rigidity, which contributes to high-speed stability whether riding alone, or with a passenger and cargo. The star-pattern 5-spoke wheel design offers optimum rigidity for high-power performance.​ ​Machining and pinstriping on the wheels add to the high-quality image. CHASIS: TRELLIS FRAME: The lightweight trellis frame provides strength to harness the incredible power of the supercharged engine and features a balanced flex to achieve optimal rigidity for both sport riding and comfortable sport touring. The Ninja H2™ SX SE+ shares a trellis frame design similar to that of its Ninja H2™ and Ninja H2™R counterparts, but it has been completely redesigned for compatibility with passengers and luggage​. HIGHLY DURABLE SELF-REPAIRING PAINT​: Features a special top coat that allows certain types of scratches to repair themselves, enabling the paint to maintain its high-quality finish through normal wear and tear*. ​Self-healing is achieved through microscopic soft and hard segments within the top coat to work like a chemical spring that creates a trampoline effect to absorb impacts. LARGE WINDSCREEN​: ​Ideal for added wind protection at highway speeds. HEATED GRIPS: ​Heated grips enhance comfort against frigid elements while cruising on the open road. KAWASAKI LAUNCH CINTROL MODE (KLCM): ​3-mode Kawasaki Launch Control Mode (KLCM) controls engine output to provide incredible acceleration from a stop by minimizing rear wheel-slip and front end lift. DUAL-DIRECTION KAWASAKI QUICK SHIFTER (KQS): Dual-direction quick shifter allows both clutchless upshifts and downshifts for seamless acceleration and smooth deceleration. FULL COLOR TFT SCREEN​: High-grade full color display features TFT (thin-film transistor) technology to ensure a level of visibility previously unobtainable. Two selectable display modes (Touring or Sport) allow riders to prioritize the information they want to see depending on the current ride. LED CORNERING LIGHTS​: Three LED lights built into each side of the fairing activate based on lean angle (one light at 10°, an additional second light at 20°, and all three lights illuminate at 30° and above) to help illuminate the road when cornering. ENHANCED FUEL RANGE: ​Superb fuel efficiency combined with a 5-gallon+ fuel tank delivers outstanding cruising range, with instrumentation. ELECTRONIC CRUISE CONTROL: A simple press of a button allows the rider to set a desired speed to enable relaxed cruising and enhanced riding comfort. 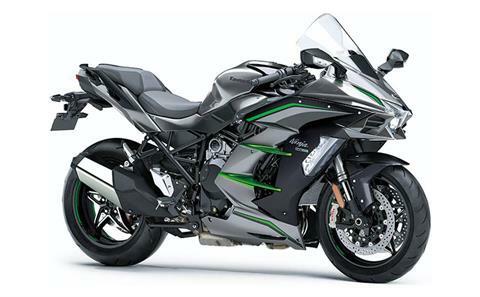 AMPLE WIND PROTECTION: Full-fairing bodywork offers a balance of rider comfort and arerodynamics, strategically shielding the rider without causing adverse drag at higher speeds. IN-HOUSE-DESIGNED BALANCED SUPERCHARGER: Developed to go beyond the daily applications of today’s sportbike rider, the Ninja H2™ SX SE+ utilizes a balanced supercharged engine that offers optimal output performance in the low to mid rpm range while achieving excellent fuel efficiency.​ The centrifugal-type supercharger is incredibly efficient at compressing air while minimizing heat. As a result of the supercharger’s efficiency, no large, heavy intercooler is required to cool the compressed air. The supercharger was designed to match the engine, allowing high-efficiency operation over a wider range of conditions than could be provided by any other typical supercharger. RAM AIR INTAKE: Designed to deliver fresh air to the supercharger to increase efficiency and match the airflow requirements of the balanced supercharged engine. The Ram Air intake opening is 80% that of the Ninja H2™, matching airflow requirements of the balanced supercharged engine, to optimize flow (and response) at the low-mid engine speeds. Ram Air duct was designed to route fresh air to the supercharger in as straight a line as possible, contributing to the increased supercharger efficiency. SUPERCHARGER IMPELLER: The Ninja H2™ SX SE+ supercharger features an in-house designed impeller—the shape and angle of the blades are optimized for the high-efficiency engine. The complex impeller is formed from a forged aluminum block using a 5-axis CNC machining center for precision and durability. Grooves etched into the blade surfaces help direct the airflow. THE PLANETARY GEAR: Designed using technology from Kawasaki Heavy Industries, LTD (KHI) Aerospace Company, the planetary gear is incredibly compact and efficient at transferring power. The planetary gear train runs off the crankshaft—with speed stepped up by an intermediary gear—ultimately producing an impeller rotation of 9.2x the crank speed, reaching maximum speeds of nearly 130,000 rpm, to produce optimal airflow. 998cc INLINE 4-CYLINDER ENGINE: The balanced supercharged engine delivers both exhilarating acceleration and superb fuel efficiency. The key to achieving this balance was increasing the engine’s thermal efficiency by utilizing a high compression ratio. Cast (rather than forged) through a unique process, the high compression pistons of the Ninja H2™ SX SE+ are lightweight—yet strong—and able to withstand extremely high temperatures. 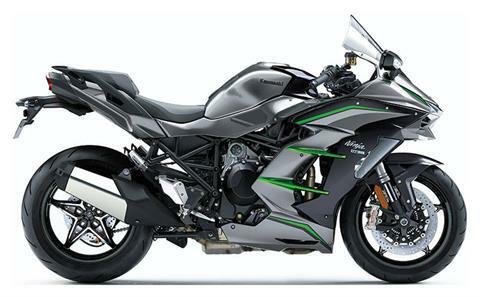 A two-stage machining process for the cylinder head (race technology developed for the Ninja® ZX™-10R) is used to form the throat of the intake ports – resulting in smooth intake airflow for maximum efficiency and performance. Hydraulic Assist and Slipper clutch offers light clutch pull and minimizes wheel chatter caused by downshifting​.